« Game Review: Goat Simulator! Marvel’s newest entry in Phase Two of their Cinematic Universe, Captain America: The Winter Soldier, has officially released today. Join me on The Uncommon Geek for a full review of Marvel’s latest blockbuster, a film that exceeded my personal expectations, and one that is easily the best follow-up to The Avengers yet. SPOILERS AWAIT! As anyone who read my post about Thor: The Dark World will know, I have been a bit disappointed with the Marvel films that have served as sequels to the juggernaut that is The Avengers. That is especially true with Iron Man 3, an otherwise decent film that was almost completely ruined by a nonsensical ending which threw a serious wrench into the development of The Avengers: Age of Ultron. I say all of that to reinforce the fact that I went into my viewing of Captain America: The Winter Soldier, with my expectations set lower than usual. I am happy to report that my expectations were shattered, and in a very good way. One of my biggest gripes with Captain America: The First Avenger, is that the film was too quick to jump into The Avengers and barely gave us any development of Steve Rogers post-thaw. The Winter Soldier, thankfully, starts off at a slow, but steady pace, setting up plot points for later in the story, but also giving us a few quiet moments to see what has become of a Captain America who is still adjusting to modern times. Especially amusing, is that Steve is keeping a written list of the things he needs to catch up on from the last seven decades, and that list includes watching Star Trek, Star Wars, and Rocky. In ways that are both comedic and tragic, Steve Rogers is a man grossly out of time, and he has lost his sense of purpose and belonging. His integrity, honor, and sense of duty are as strong as ever, but he has woken up in a United States that he barely recognizes, and he questions his place in this new world. These doubts come to a head when the Captain butts heads with Nick Fury, the director of S.H.I.E.L.D. Fury, as he eloquently puts it, has trust issues, and his lack of forthrightness is something greatly at odds with Captain America’s ideals of trust and honesty among comrades. Rogers is at his wit’s end with S.H.I.E.L.D. and its layers of lies, cover-ups, and duplicity, but when he considers walking away from the military life, he is left to wonder, what else could he possibly do? Steve Rogers’ new friend, Sam Wilson (performed extremely well by franchise newcomer Anthony Mackie) tells Rogers that he could do whatever makes him happy. But what is that, to a man whose entire existence has been dedicated to serving his country? I am really glad that this film stopped to ponder these questions, and as Captain America, this is by far the best acting performance I have seen out of Chris Evans yet. The Winter Soldier’s action kicks into high gear when an attempt is made on Director Fury’s life. He has come across information that can potentially compromise S.H.I.E.L.D., and that intel has apparently pissed off the wrong people. Assassins, posing as police officers, engage Fury in a ferocious car chase that tears through downtown Washington D.C., and when they fail to bring Fury down, the Winter Soldier himself makes a startling appearance. Fury only escapes with the help of a S.H.I.E.L.D. gizmo that can apparently melt through concrete, and which I assume allowed him to flee through the sewers. As this is the first scene with Winter Soldier in it, I have to say that the initial impression his design left on me was pretty damn awesome. His look has some elements of Kai Leng from Mass Effect 3, and to me at least, even a little bit of Shredder from Teenage Mutant Ninja Turtles. What makes him more believably menacing is that he doesn’t even speak in his first few scenes. An enemy that doesn’t need to utter a single word to communicate his intent is, to me, more intimidating than a big blabbermouth, like, say, Killian from Iron Man 3. This comes to a head when Fury shows up at Steve Rogers’ apartment. When Fury tells Rogers not to trust anyone, and that his every move is being watched, the Director is shot and killed by a sniper, which turns out to be the Winter Soldier himself. 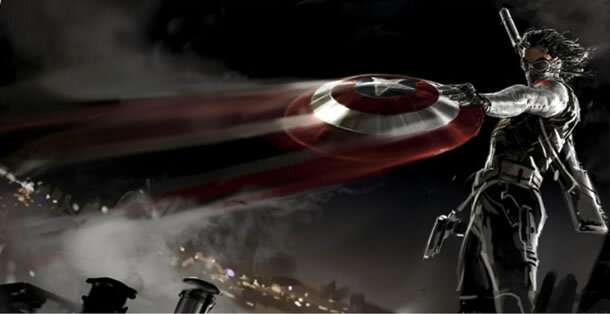 In a brief but very cool chase, the Captain storms through rooftops after the assailant, and has his Vibranium shield caught by Winter Soldier’s mechanical arm. It’s one of those cool moments that visually conveys that the hero of the story has met his match. The death of Nick Fury is devastating for not only the Captain, but for Black Widow and Agent Maria Hill as well (Scarlett Johansson and Cobie Smulders reprising their roles, respectively). Black Widow has a strong connection to Director Fury, and aside from Hawkeye, he is probably the closest thing that she has to something resembling a friend or family member. Worse yet, she is haunted by the fact that Fury was killed by the Winter Soldier, a Soviet agent that she has tried unsuccessfully for years to track and kill, a man she refers to as a walking ghost story. I go into step by step detail on these scenes because they set Captain America up for the greatest test of his integrity and loyalty yet. In the wake of Fury’s death, Steve Rogers is summoned by Secretary Alexander Pierce, a member of the World Security Council, and the man who apparently inherits control of S.H.I.E.L.D. once Nick Fury is no more. Robert Redford was a good choice for the part of Secretary Pierce; he lends a great deal of experience and gravitas to the role, and quite believably portrays a man who is part slimeball, and part sympathetic pragmatist. That small bit of sympathy comes about not because of what he is ultimately trying to do, but simply that how he initially arrived at seeing the world as he does, has a certain logic to it. Pierce doesn’t waste much time, and flat-out asks Steve Rogers what he knows about Fury’s death. Against his nature, Rogers heeds Nick Fury’s dying words, “don’t trust anyone,” and does not comply with Pierce’s request. But as Black Widow pointed out, the Captain is not a very good liar, and Pierce sees right through him. In a key moment that defines the tone for the rest of the film, Captain America is forced to fight his way out of S.H.I.E.L.D. headquarters. The elevator scene that sets up this escape is priceless, and is a must-see moment of the film. So now, Captain America, patriot of all patriots, is branded as a traitor and fugitive of justice by S.H.I.E.L.D. Even some of the agents themselves can’t believe it, including a sleeper who was posing as Steve Rogers’ neighbor. I find that this tone is an important aspect of this film’s political commentary, as here we see the ultimate American Big Brother organization, S.H.I.E.L.D., become more interested in preserving “safety” and “security” instead of freedom, liberty, and justice, and in so doing, they aim to bring down the man who is the living embodiment of the old American ideals. It’s not as far removed from reality as you might think; even as we speak, government organizations like the FBI and the IRS are being used to target and harass American groups that have anything to do with patriotism, limited government, and espousing of liberty over security. Now fugitives on the run, Captain America and Black Widow are forced to investigate Nick Fury’s death and the compromising of S.H.I.E.L.D., with their only clues lying on a flash drive that was acquired in the movie’s opening action sequence. This leads to a really fun scene where the two heroes have to go incognito in a shopping mall. It was extremely funny to watch Steve Rogers bumbling around with geeky, thick rimmed glasses, and oversized sneakers, and what made it even better was matching him with Black Widow, an expert in disguise and infiltration. Not only do Evans and Johansson have great on-screen chemistry, but having these two characters matched together in this situation can lead to comedic gold. The kiss scene had most of the theater rolling. Cap and Black Widow track down the origin of the S.H.I.E.L.D. data to an old Army base, where they uncover an old, hidden database. This presented, at least to me, the biggest and best surprise of the film, where it turns out that S.H.I.E.L.D. had recruited the Red Skull’s old henchman, Dr. Arnim Zola, and that the not-so-former after all HYDRA agent re-vitalized his old organization from within S.H.I.E.L.D. Zola placed his mind inside a massive computer center, and created an algorithm that would allow the new HYDRA to pinpoint where all of its potential enemy’s would be throughout the entire world. With S.H.I.E.L.D.’s newer, deadlier fleet of Helicarriers about to launch, HYDRA would through them, and Zola’s algorithm, have the means to suppress the entire planet. What I found to be subtly brilliant about this revelation, is how it parallels the real-world adoption of Nazi scientists by the Allied powers after World War II. Men whose work was condemned when it was done for the Nazis were suddenly protected and cherished when countries like the United States were able to use them for their own gains. Wrong is wrong, no matter which flag that unethical work is being performed under. Zola is ultimately sacrificed by Secretary Pierce, who is revealed to also be a HYDRA agent, in a missile barrage that nearly kills the Captain and Black Widow as well. This brings up the ultimate question of trust on the part of Black Widow. She had abandoned her blood-stained past with the KGB to do right by way of working for S.H.I.E.L.D., only to find that she had traded one corrupted organization for another. There is a great bit of dialogue between her and Steve Rogers before and during their refuge with Sam Wilson. She has spent most of her life being other people, creating personas to match whatever her mission required, but everything is always a lie. The complete opposite of her is Captain America, a man who couldn’t make a lie stick to save his life, and is the embodiment of truth and trust. These two characters couldn’t be more different and yet complement each other perfectly. Agent Hill returns to the scene and brings the Captain, Black Widow, and Wilson in to one of S.H.I.E.L.D.’s secret safehouses, where, surprise! Nick Fury is alive and slowly recovering from his near-death experience. I wasn’t totally surprised to see that he was in fact alive, but I also wouldn’t have been shocked to have seen Fury actually die. Since Joss Whedon is involved with the Marvel movies now, I can never completely believe that major characters can’t be killed in these movies. This scene sets up the protracted endgame, where the heroes have to infiltrate the Helicarriers, and replace Zola’s HYDRA algorithm with a self-destruct sequence. Also setup for the endgame was another previous fight between Cap and Winter Soldier, in which Rogers almost triggered the latter’s repressed memories as Bucky Barnes. It turns out that Winter Soldier, no longer a Russian agent after the collapse of the Soviet Union, is now just a tool of HYDRA, and in a disturbing and violent scene, Secretary Pierce orders Winter Soldier’s brain to be reset again, so that he will not hesitate to kill Captain America. Winter Soldier is nothing but a victim who has been used by the Soviets and HYDRA as a glorified human tool, and after this scene it is hard to not feel sorrowful for him. To do a play-by-play analysis of the action-packed endgame would fill pages, and would also do no justice to it, but let me just say that it is a spectacle worth watching. It doesn’t quite hit the level of awesome as at the end of The Avengers, but it is the next best thing that I have seen Marvel deliver. That said, I will comment on a few specific points: Sam Wilson becomes the Falcon in the attack on the Helicarriers, and while he is a welcome addition to the roster, I couldn’t help but think that, everything Falcon does, Iron Man could do, and better. The way the story unfolds, and with the way Iron Man 3 ended, it makes sense that Falcon is involved and not Iron Man, but it is hard not to think about it. Also, Black Widow masquerades as a World Security Council member is an unexpected but awesome fight scene that gives Secretary Pierce some comeuppance, though I think the audience was disappointed in a way that it wasn’t actually the old woman who just kicked all of the henchman’s asses. Perhaps most importantly, just before he launches himself into the fray, Captain America breaks into the S.H.I.E.L.D. headquarters and makes a rousing speech over their P.A. system. It’s not one of those cheesy, cliche, chest-beating, proud to be an American speeches, but rather it is a poignant, relevant, and inspirational message that rouses the honor and integrity of those agents not corrupted by HYDRA. It shows us why Captain America is the heart of the Marvel universe; he is not “perfect,” but he is pure, honest, and represents the best of not just American ideals, but the ideals of anyone who values a world of liberty over one of fear. The final showdown between Cap and Winter Soldier doesn’t necessarily end in a shocking way, but it nicely acts as a mirror to the last scene with Bucky and Rogers in The First Avenger. Unlike that film, the last scenes in this movie don’t try to force it to directly tie in with an Avengers film, but instead set pieces in motion for any number of stories to follow up on. Plot threads introduced here would easily set up stories for an Iron Man 4, Avengers 2, an interesting new direction for the Agents of S.H.I.E.L.D. television series, and to a lesser extent, this summer’s upcoming Marvel film, Guardians of the Galaxy. Although this is a spoiler review, I don’t want to reveal everything, so I recommend you watch all of the ending scenes, bonus post-credits scene and all, to draw your own conclusion about where the Marvel Cinematic Universe is heading. 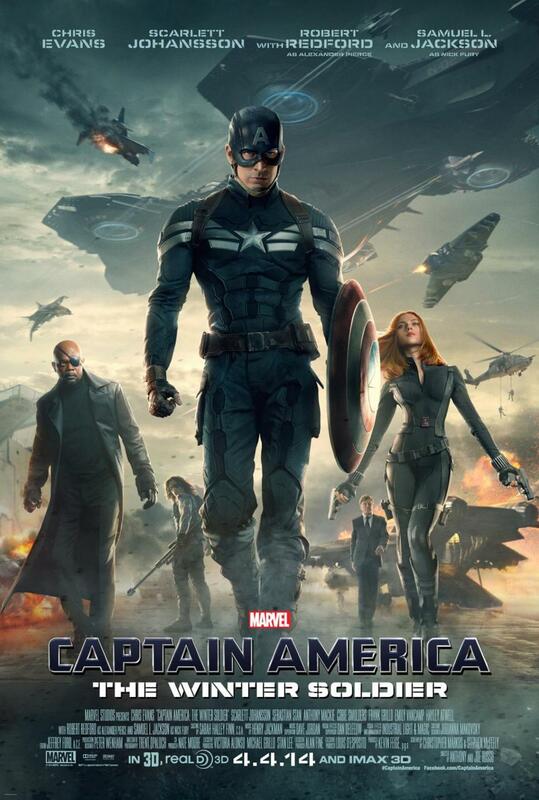 Captain America: The Winter Soldier is an awesome, thrilling ride that is a fantastic blend of action, comedy, and commentary about today’s world. It has the best Stan Lee appearance yet, it shakes up the Marvel world in a way that makes WAY more sense than Iron Man 3, and also has a hilarious and unexpected cameo from Iron Man 2. It is the next best thing that Marvel Studios has released since the first Iron Man and of course, The Avengers. I heartily recommend it for a theatrical viewing, and I also consider it to be an absolute must-own when it releases on home video.